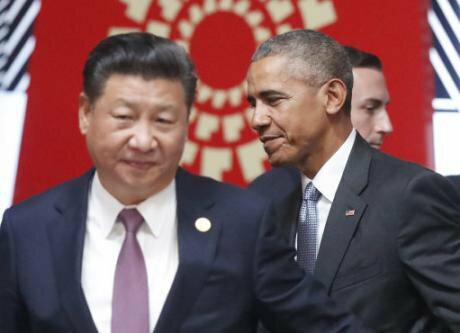 Barack Obama walking past China's President Xi Jinping at APEC’s opening session in Lima, Peru, Nov. 20, 2016. Pablo Martinez Monsivais/Press Association. All rights reserved.The Chinese regime has had a good 2016 because it was a bad year for democracy. Official Chinese media and various commentators have made fun of the Brexit referendum in Britain and the Trump victory in the United States as being what you get if you are careless enough to let the people decide. The Brexit referendum in Britain and the Trump victory in the United States… what you get if you are careless enough to let the people decide. The Chinese system is being held up as a model of stability. The leader, Xi Jinping, has exploited uncertainty and vacuum in 'the West' first at the Asia-Pacific Economic Cooperation meeting in Peru in November 2016 and then at the World Economic Forum in Davos in January, to brazenly offer China up to the world as the guarantor of economic openness and free trade. The awkward thing for the democracy side is that the Chinese dictators have been given a godsend of democratic weakness, so much so that western democracy is widely seen to be in “crisis.” Both the Brexit vote and Trump’s victory were perverse. In Britain, there is a majority in the population and in Parliament in favour of continued membership in the European Union, but because of low voter participation among the young, that majority did not prevail in the referendum. In America, the losing candidate won the majority of the popular vote, but not in enough states to carry the election as constitutionally required. In both countries, ugly campaigns embraced and encouraged sundry voices of xenophobia, fear of the other, racism and divisiveness which until the fateful year of 2016 we had thought marginalised to the dark and dusty corners of the house of modernity. The turmoils of democracy in the West represent a shift in the balance of soft power in the world. Europe and America, in confusion and uncertainty, today look unimpressive. It is easy for Beijing to present the Chinese model as safe, stable and predictable. It is this shift in the power of esteem that Xi Jinping has been able to play on, successfully, in his travels to the West. In both countries, ugly campaigns embraced and encouraged sundry voices of xenophobia, fear of the other, racism and divisiveness. But there is more to Beijing’s interpretation of the misfortunes of democracy. The Chinese leaders have perfected a model which has proved itself functional for the perpetuation of their own regime. It is for that purpose above all that they are determined to retain dictatorial control and not risk democratic reforms. However, there is also a view, both among regime insiders and some commentators, such as the political scientist Daniel A. Bell in his The China Model, that the Chinese political system is genuinely superior to any democratic system, both in delivering effective governance and also morally. We cannot know if the Chinese leaders really believe that their model is superior, or if their claim to superiority is only window dressing for the maintenance of the dictatorship they depend on. But if there is a temptation on their part to believe their own propaganda, that temptation will now have been stimulated. In my own analysis of the Chinese system, in my book The Perfect Dictatorship, I see the Chinese regime as a dangerous one in the world, or at least potentially dangerous. Its propensity to aggression is most visible in the South China Sea. The Chinese state is powerful. What may make it dangerous is a conviction in the minds of the leaders in Beijing that they are the custodians of a unique virtue. That conviction they are themselves cultivating with the revival of ideology in the form of the nationalistic and chauvinistic rhetoric of “the China Dream.” It has now been given the additional stimulus that their model has suddenly come to look better compared to the alternative. When democracy performs poorly, it is logical that those who have advocated autocracy feel that history is proving them right. It is logical that the leaders of a powerful state, who believe to be seeing that history is on their side, will make their state a more assertive one vis-à-vis neighbours and others. If there is a temptation on their part to believe their own propaganda, that temptation will now have been stimulated. There is a competition in the world between western democracy and Chinese-style autocracy. For the west to stand tall in that competition, democratic governments must see to it that their democratic systems perform, deliver and command respect. The way to do that is through constant reform. Democracies are imperfect. They are strong not by being perfect – only dictatorships can be perfect – but by imperfections being recognised and worked on. 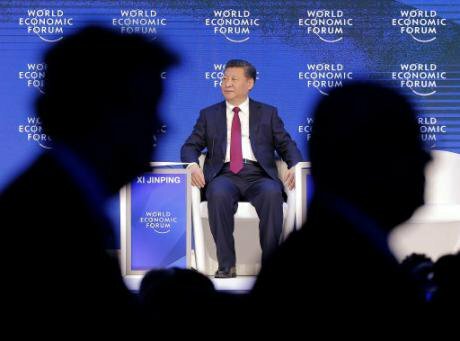 Xi Jinping on the podium at the World Economic Forum in Davos, Switzerland, Jan. 17, 2017. Michel Euler/Press Association. All rights reserved.The systems the Chinese leaders and others are now able to make fun of, have neglected the imperative of constant reform. In America, the main problem is that the power of money has been allowed to prevail so that ordinary citizens rightly feel that the system is rigged in favour of the rich and that they themselves have no say. In Britain, the main problem is an excessively centralised system of political power with a wide gulf of distance between the rulers in London and the people throughout the land. In both countries, income and wealth has been redistributed to the rich and ultra-rich, leaving the middle class, not to mention the poor, behind in neglect and humiliation. In both countries, income and wealth has been redistributed to the rich and ultra-rich. It is an uncomfortable truth, as we leave 2016, the year of reaction, that democracy is in trouble. But the trouble for democracy does not come from Beijing, or from globalisation, or from abroad, or, in Britain, from immigration or from Europe. It resides at home. The trouble for democracy, at this time in history, comes from our own poor ability to reform.